In every collection, there is always a polish which is the runt of the litter. It's the one that doesn't get much love and / or attention and the one that most people overlook. 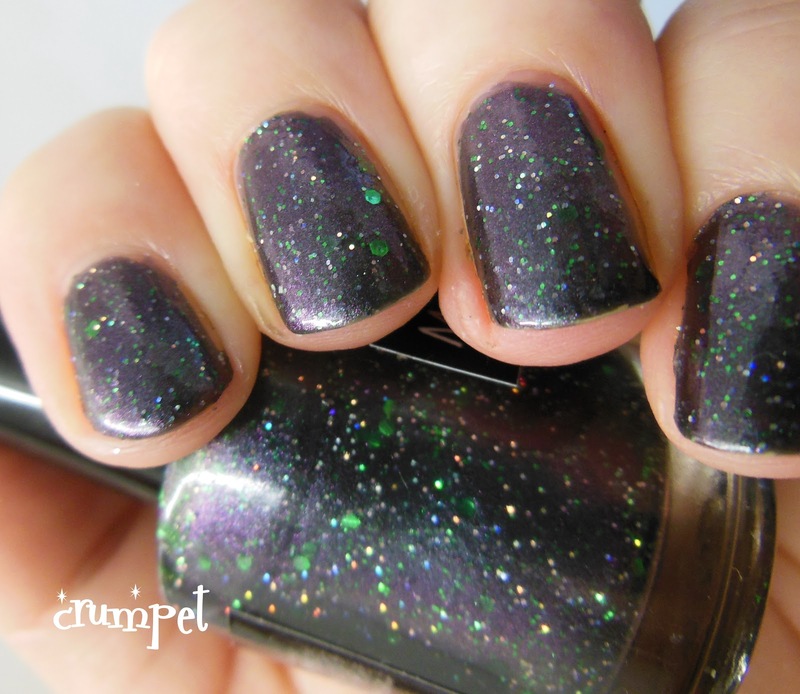 Usually, it's this same polish that people refer back to months or years later as the standout from the Collection - it's a creeper in our affections, the equivalent of a movie sleeper. This is that polish. My Birthday Group gifted me the entire Crows Toes set for my birthday - I'd been lemming them for yonks, and as I can also be a nightmare to buy for, it was a win / win for everybody! When they arrived, I ooohed and aaahed, and I even appreciated the majesty of the white and the black. This one, this got a brief meh and was pushed to the back of the pile. Aw, poor polish. But here's the astounding thing - in the bottle, this looks gunmetal grey dull, on the nail .... stunning. 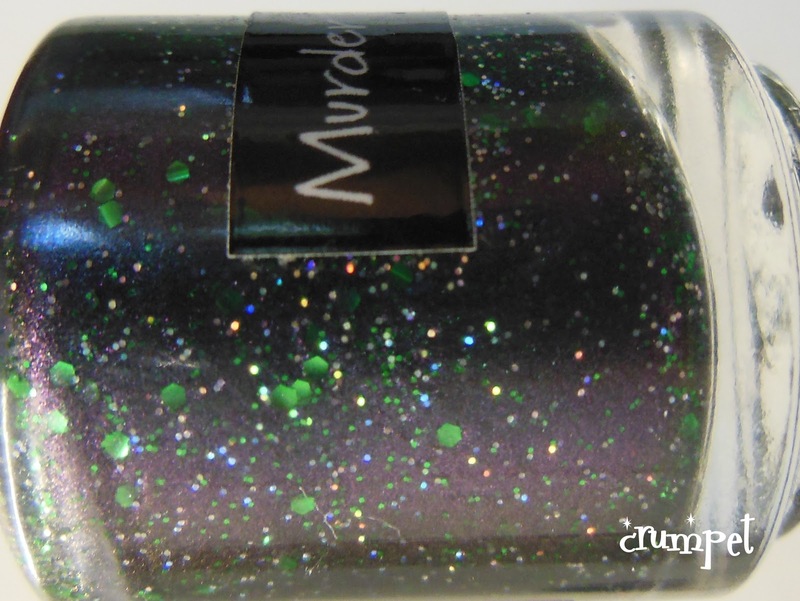 Murder By #'s is dark, decayed and devious - it's the perfect witch's polish. Murder By #'s isn't grey at all - it's a purple-green duochrome - and how I didn't notice that at first glance, I do not know. It's also laden with green glitter and holographic glitter. Seriously, this is a witches brew of a polish - it looks like toads, lizards and dragons gave their guts and scales to make this one come to life. Pleasingly for me, this settles most at it's purple base, but rarely for a duochrome, you can see the purple and the green AT THE SAME TIME on the nail. I've struggled to capture it in photos, but it is there - a nail that's green AND purple at the same time. This really is a special polish, and it requires a unique creativity to imagine it. Kudos to Lauri for birthing this bitchin' brew. It's what this witch will be wearing all Hallowe'en.